We. The Revolution Review - What Kind of Judge Will You Be? Now is a time to look back in anger. The world is as close to on fire as it ever has been in my life, and while this fury hasn’t spilled out into the streets (much) yet, the tension is there. And whether or not you find yourself on the side of the revolutionaries or the old guard, everyone is likely to get burned. Or at least, that’s how it feels playing We. The Revolution. Looking back at another moment of political uncertainty, the game thrusts the players into the heart of the French Revolution. But instead of Assassin’s Creed’s hobbled attempt, this takes a more focused look at the people and players on the barricades of this turbulent time. Don’t worry, there’s no emotional singing, or people with the same name twice (that I noticed). Instead, the player takes the role of a judge walking a knife edge between the revolutionary fervor and rule of law. 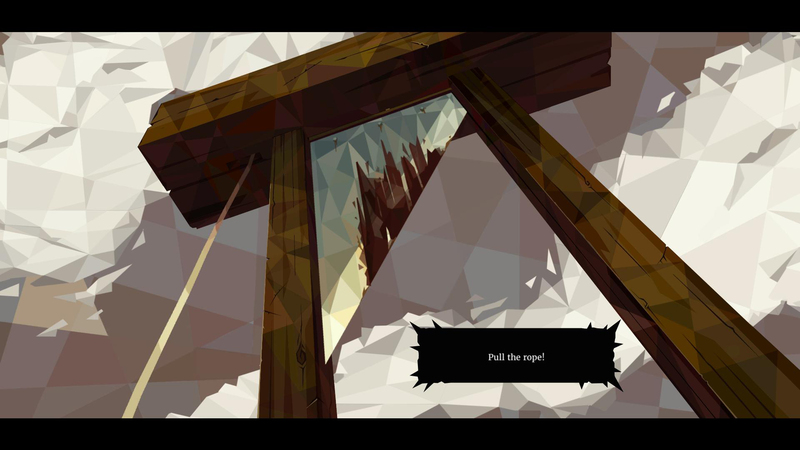 The game makes it clear quite early on that you are a man of means, which would normally make your life an easy one, but with gallows and guillotines being erected all across the city your stature might just be your downfall. 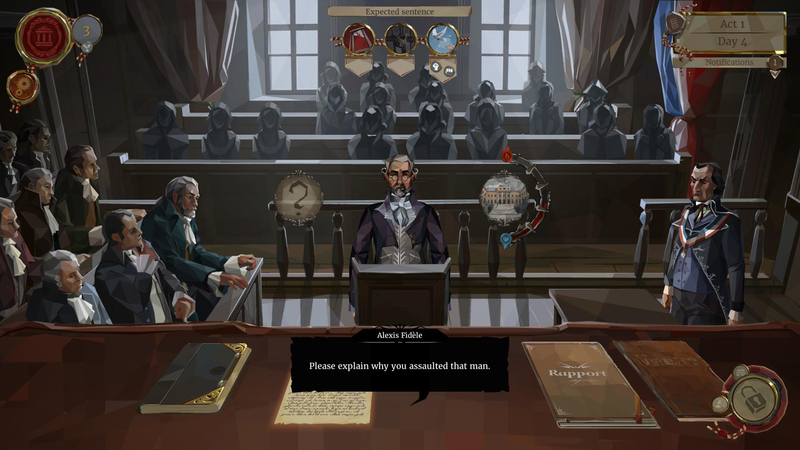 Players have to spend their days working in the courthouse and deciding the fate of their fellow countrymen, while at night they have to reconcile with their distant and worried family. A lot of what makes We. The Revolution so tense is the unpredictable outcomes of your decisions. This is a game and a setting where the unexpected became the norm, and you can feel that in more or less everything you do. Each night you can choose what activity your family will undertake, and these choices can increase, or decrease your standing with each member. The game will tell you exactly who will be affected by each choice, but not how it will influence. On my first evening, and worried about the thinly veiled threats of my wife, I decided to take my entire family out to an evening at the theatre, something I assumed would raise their spirits. It did not. Family matters might seem trivial as you hold the fate of people in your hands by day, but the two are more combined than you might think. As a judge, you are the face of the legal system, and as a result, your decisions there influence the way others see you in this polarising time. The game focuses on two factions, the revolutionaries, and the common people, who each have an opinion of you. Make a decision that impacts one group badly, and they will remember it. Support them, and they will support you too. Like other political paper pushing games, such as Papers Please, it’s best to keep everyone as on side as possible. But in a similar vein, that can be difficult to balance, ethically. You are meant to be a judge, deciding a verdict based entirely on the evidence and arguments presented to you, but to be a good judge puts you at great risk. Imprisoning a man that stole from the rich is technically correct, but the baying mob in the pews might think differently. And that might put you in risk. It, assuming you’re invested in the characters and world that the game presents, can give you that enjoyably uncomfortable knot in your stomach as you try to decide whether to do what is right, or what is safe for your character. Unfortunately, the trail itself isn’t as fun as delivering the verdict. When a case is presented, players must read through the evidence before deciding what to question the defendant on. This is a little tricky to follow and can make the case harder to understand when it comes to making a judgment. The case is divided up on a wheel into several key events, from the job of the defendant to the step by step process of committing the crime. Then the player has to pick what these key points mean, which can be anything from ‘extenuating circumstances’, ‘accusation’, ‘offenders personality’, and ‘evidence’ plus a handful more. These vague options may make it difficult to extract the right answer from the possibilities. Players only have a limited number of mistakes they can make, and the game even throws in red herrings as well for extra difficulty. Unlike L.A. Noire where the game laid down just three options that could have diverse meanings, We. The Revolution offers half a dozen vague responses. It makes the decisions tense as you go through the points, but that tension comes from poor communication rather than a real sense of unpredictability. And this spoils the experience a little, making it difficult to really take on the role of the judge as more often than not, these links become a guessing game as you try and put the correct word to the statement. But behind this is an extremely pretty game with a lot of difficult decisions to make. It expands on the premise of other games like it, and while it stumbles in the attempt, the atmosphere and tension is real and very, very engaging. Next to none of the lines in the game are spoken, so players have to be okay reading a bit, but the loveling rendered low-poly, high colour assets make the game incredible to look at, even with the required reading. We. The Revolution might not be the next king of the political indie collection, but it certainly doesn’t deserve the guillotine.